The Motif XF is a great sounding and feature-packed board that delivers a knockout sonic punch. Warm sounding with plenty of real-time control. Feature packed and surprisingly easy to navigate. Flash memory option is a very welcome addition. Inserts on patches don't reset to 'on'. Expensive, so you may have to think hard about whether a MacBook and controller is a better option. The fourth edition of the Mofit range is probably Yamaha's best workstation yet. The flash memory option expands the Motif's possibilities nicely. The Motif has been a big name in the workstation world since its launch in 2001 and it's good to see Yamaha has not forgotten the workstation concept just yet. However much has changed in the studio world and unlike the first Motif, computer integration is shaping the way workstations are now built. USB is now standard for data transfer (and to communicate with the included Cubase and free editing software), plus now there's a FireWire card option, allowing you to record up to 16 tracks of audio directly into your DAW from the XF - turning the XF into a suitable audio interface. "The XF is one impressive bit of kit. It's pricey but there's a lot under the hood and it's quality throughout." We have to say that the XF is, without a doubt, one of the best looking keyboards Yamaha has made in a long time and it looks and feels classy throughout. The only slight concern is that it's easy to leave greasy fingerprints on the black front panel, but a good microfibre cloth soon sorts that. 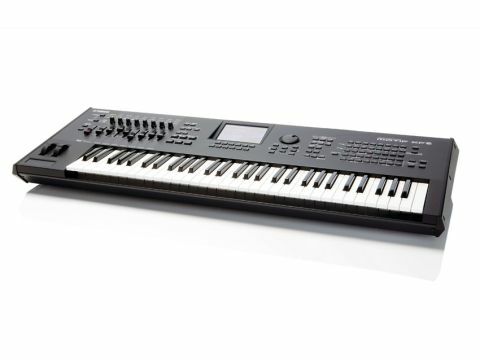 The model for this review is the Motif XF6, which includes a five-octave synth-action keyboard. This is well-balanced light-touch action, which is equally at home for piano and synth sounds. Weight-wise for gigging, the XF6 is just about on the right side of portable. The front panel is laid out in familiar Yamaha style and anyone that has owned previous Yamaha boards will feel at home. Sure, the XF is a powerhouse under the hood but for once, it's surprisingly easy to navigate. The colour screen takes centre stage and though it's not a touch screen, (which is a shame) it conveys a lot of information in a pretty elegant way, though it does take a while to get used to the way the menus are laid out in relation to the function keys below. All things considered, the interface is probably the best we've encountered on a Yamaha workstation to date. Sound-wise, the XF has a lot of patches and the wave memory has been upped to 741MB from 355MB (giving 3,977 waves to work with). Many voices are the same as outgoing XS models though there are plenty of new sounds, including 128 voices and eight new drum kits. We've always been fans of Yamaha's sounds and the XF contains just about everything you could wish for, for any style of music. What's most impressive is the level of expressiveness that can be coaxed from its sounds. Using the performance sliders in conjunction with the expanded articulation feature, (plus the dials, wheels, ribbon, aftertouch and pedals) allows you to control pretty much any parameter you can think of directly. While we don't find the acoustic piano, organ and clav presets to be the most authentic around, they are nonetheless expressive, inspiring and playable and getting stuck in to sound tweaking is a pleasurable and ultimately rewarding process. In terms of sound shaping, there are 18 filter types onboard (these sound great and for once on a digital workstation are smooth and without stepping artifacts) plus amp pitch and filter envelopes, EQ, lashings of high quality effects, modelled amps and a decent vocoder (though as ever, too many of the presets are swamped in huge reverb). One annoyance here is that if you switch off the insert and system effects from the front panel buttons, they don't reset to 'on' for the next patch. Maybe this can be sorted in a software update? The Sequencer onboard the XF is powerful and fairly simple to use via the large colour screen - it's a great scratchpad and ideas tool. There are two modes to work with, the first is 'Song' mode, which allows linear recording while the second mode 'Pattern' mode, allows you to build your track in sections or loops then chain them together. There's extensive event editing too (plus quantise and more) and the sequencer has a nice feel to it too with decent resolution. One minor gripe is that in quite a few of the edit windows you have to stop the sequencer, which can interrupt the flow a little. This aside, the sequencer is powerful enough to compose whole tracks and you can also drop samples, though no direct recording of audio into the sequencer is possible. Finally, the four-part arpeggiator is very powerful with thousands of different preset modes, plus it has super comprehensive editing and performance features. Arpeggiations can be as complex as you want, plus the XF's arpeggiators can produce powerful intelligent auto-accompaniment backings, particularly when using the chord recognition feature. The quality of the sampled waves are great throughout and these can be layered up to eight times in a voice too, plus velocity switched and key mapped to certain areas of the keyboard and a whole lot more. Let's not forget about the XF's new flash RAM too, which can be added via optional cards and allows you to integrate your own samples with those already onboard. This is nothing exciting but at least finally you can keep your samples onboard even on power down. In addition, there is now built-in onboard SDRAM sample memory too. One of the most endearing and inspiring aspects of the XF is that its overall quality of sound is stunning. It's warm and analoguey, yet hi-fi and above all else, very musical which helps it blend effortlessly into tracks alongside real analogue synths (which the XF also emulates very nicely) and other real world acoustic instruments. Particular highlights include some of the best solo strings/strings sections we've heard onboard a sample-based synth, some very nice Rhodes pianos and acoustic guitars, great analogue style leads and basses and also some very playable drum kits, percussion and drum machine kits. All in all, the XF is one impressive bit of kit. Yes it's a lot of money, but you get a lot for that outlay. As workstations continue to become less relevant, potential buyers are usually caught deciding between something like the Motif and a reliable laptop such as a MacBook Pro and a high-quality keyboard controller but it has to be said, for live performance, the Motif still takes the biscuit. It sounds incredibly rich and musical, the effects are great, the sequencer is useful (if a little clunky in operation) but there's a lot to be said for the scope and quality of the synth at the heart of the XF and that's what most users will be interested in. With the added flash memory and SDRAM for sampling, the XF can truly grow with the user, while also ensuring that the workstation is still a relevant tool in the composer/producer and live performers arsenal. The XF is without doubt Yamaha's best featured and best sounding workstation to date.